Time: Part of local mythology in the Bahamas, alleged carcass washed up in Florida during 1896. The blue holes are a vast system of deep underwater caves, lending a foreboding air to the otherwise idyllic near shore waters of the Bahamas. Like many imposing natural features, there is an associated local mythology concerned with these holes. The myths concern a giant sea monster, part shark, part octopus that supposedly lives in the blue holes, terrorising local fishermen by dragging them to their doom. Some credence was given to these simple myths when a giant, amorphous carcass was washed up near St Augusine, Florida in 1896. Many suspected that it was an enormous octopus, initial tissue analyses seemed to support this. Unfortunately, more recent scrutiny has confirmed that the carcass was actually blubber from a sperm whale. For a good while, this carcass let us speculate that an enormous octopus lived in the Caribbean Sea, only to wash up occasionally as a mangled carcass. In reality, this case is a common one, over the years; many strange, gelatinous white blobs have washed ashore all over the world. Almost always erroneously suspected to be sea monster remains, they have invariably been shown to be large masses of whale blubber. Surely, the giant squid and colossal squid show us that there can be enormous cephalopods beneath the ocean. What if the Lusca were more than a myth, and there really was an octopus carcass at St Augustine? The Bahamian Lusca (Otoctopus giganteus) is an exceedingly large Octopus, related to the cirrate octopods, but distinct from them in retaining large, powerful suckers. Mainly inhabiting secluded areas of the Caribbean Sea, the main populations are centred on the Cayman Trough and the Puerto Rican Trench. 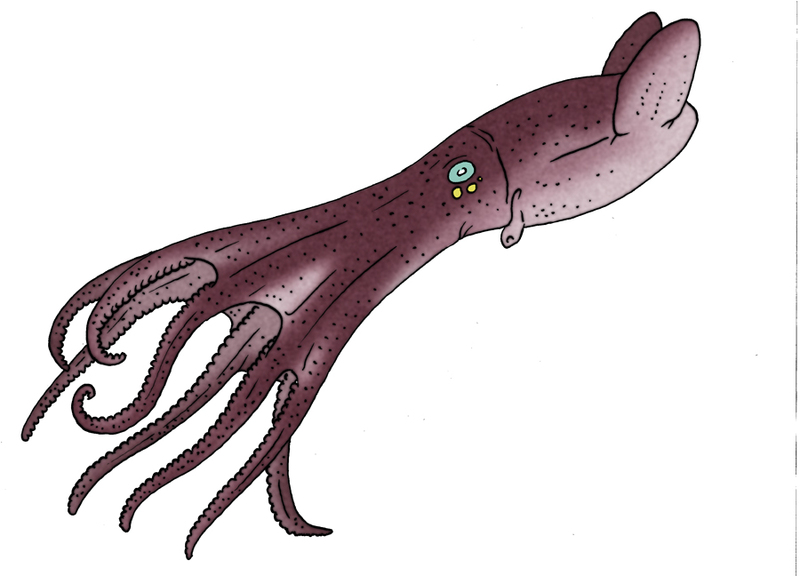 The Lusca, unusually for a giant cephalopod, is able to tolerate a range of water temperatures and depths, mainly because it will retreat to the deep-sea by day, and venture closer to the surface at night. Like many octopods, it is nomadic, and some specimens have been known to take up residence in underwater cave systems, such as the “Blue Holes” of the Bahamas. These excursions are very temporary, due to the harsh conditions and bad water quality inside such caves; possibly the Lusca becomes stranded in shallow water and seeks refuge until it can move on at night. When in full view, the Lusca is spectacular, with a mantle length of 4 metres, and a total length of up to 18 metres, it is larger and much heavier than the giant squid. Local blue holes have reputedly played host to many attacks on divers and fishermen, a hungry Lusca usually reaching out of the gloom, and dragging someone to their death. The Lusca is a powerful, but fairly slow swimmer, relying on jet propulsion and a large pair of ear-like fins for propulsion. Lusca are nocturnal, rising to surface waters by night to hunt for shark, seabass, lobster, squid, and smaller octopus. Males possess glowing organs beneath their eyes, which are predominately used in courtship, but can also be used to lure prey in low light conditions. Increasing population and habitat encroachment in the Caribbean can only mean more conflict with the Lusca, but to what ends?